Discussion in 'SteamRep General Discussion' started by Dizzy, Apr 14, 2019. I apologize if this is the wrong place to post this, but I need to get this information out there so people can stay safe. So yesterday I had a comment on my steam profile telling me to go to a certain reddit post, claiming a "giveaway". I checked the post and disregarded it because I felt like it was someone just trolling the hell out of people by claiming they will give away hundreds of dollars worth of stuff, deleted the comment and moved on. Today, I get some random guy adding me on Steam with the reddit link in his bio, I felt like something is up, so I went to go check the post again. 1. The Reddit_SkinsClub reddit appears to have been made recently, as there is only one moderator and the above post is the only post existing, made about 2 days ago from this posting date. 2. Many comments were removed by the moderator, however, if you click on some of the users, you can still see the deleted comments. One claims that it leads to a steam that apparently has you enter your password WITHOUT asterisks. 4. Many of the reddit user comments confirming it works are accounts that appear to have all been made in October, not to mention that their comment in this reddit post is the only comment/post they have ever posted. 5. If you hover over the steam profile link provided (WHICH LOOKS LEGIT), it shows that the link DOES NOT redirect you to STEAM. Instead it leads to a .space website. I have not clicked this link and do not advise anyone else to do so, this is a SCREAMING RED FLAG to begin with. I would assume it leads you to a fake steam, as stated by the one comment about having to put in your password without asterisks. 6. I decided to check out the steam profile myself using the profile ID listed in the post (765622988637426413), but by using Steam itself. The profile cannot be found whatsoever. Overall, this is the first time I've seen something like this in awhile. It feels like a hybrid of of the skins site scam. It's almost frightening that anyone could fall for this, especially because the link appears to be legit but actually redirects you elsewhere. I hope this helps you guys out somehow. Pretty common lately - make sure you report to Reddit any of those you find. a simple "MOUSE OVER" will allow you to see the URL where the link goes on any site not just that. A easy check that everyone should be in the habit of doing. Do NOT click on the report button below any of the posts. 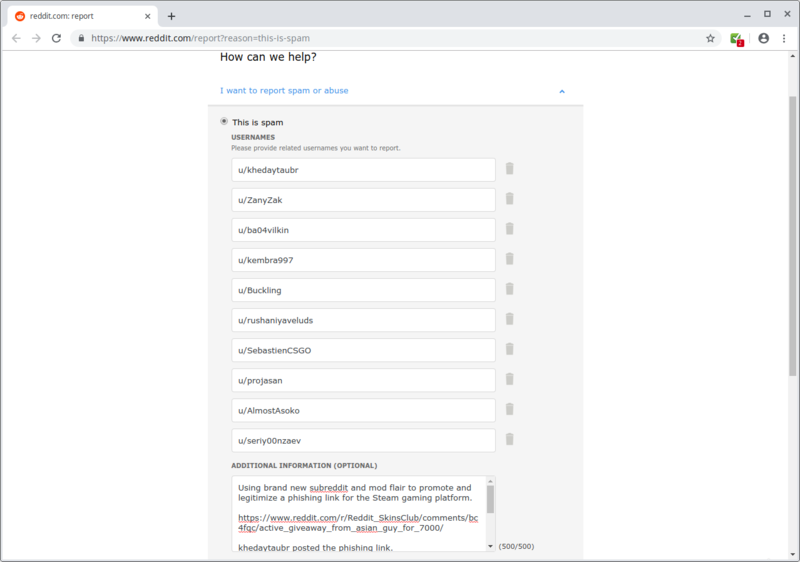 Those go right to the scammer, who is running the subreddit. The above link goes to Reddit admins. Edit: I've also hidden your link, so other people looking at your thread don't end up clicking it. Happens more often than you'd expect.